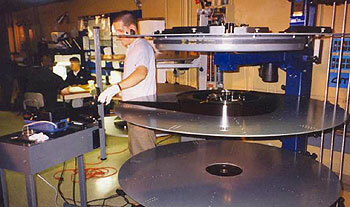 All commonly used postproduction methods for the completion of feature films can be employed in the creative editing and cutting of SDS-70 65mm camera negatives. 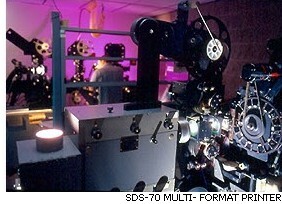 The Telecine to Avid editing technique was used for the company's SDS-70 demonstration film. A 48 fps 65mm telecine transfer was accomplished with proprietary key code software to insure frame accurate reference to the film. Once the video information was loaded into Avid systems the editors performed all standard editing functions. Opticals and digital effects such as frame conversion and image compositing of both 24fps. and 48fps. were accomplished with the supervision of the companies' process consultant using proprietary technology. One of the patented features of the SDS-70 process is the compositing of cinematic image components photographed at twenty-four frames per second with other image components photographed at 48fps. Each image photographed at 24fps. is re-formatted onto two successive frames and strung together with film photographed at 48fps. All finished film elements will be shown at 48fps. Thus scenes or even specific shots within a single motion picture can incorporate either the conventional cinematic look or the high impact experience at the discretion of the film maker. This process is called Dynamic Image Enhancement and is patented by the company. The objective of mixing frame rates is to modulate immersive images along with conventional cinematic images so that the audience does not get "over loaded" with visual information that typically happens with processes such as Show Scan and Imax. When completed the edit list was handed over to the negative cutter for conforming. A&B rolls of the final cut 65mm negative where submitted to the lab for answer printing. At the same time during post production, the final cut Avid edit was used to create audio elements for a final mix that resulted in a digital eight channel audio master.